This morning glory breakfast loaf is a nod to my favorite muffin–the morning glory muffin–a hearty, nourishing and rustic treat. We love morning glory muffins and are partial to these Sweet Potato Morning Glory Muffins which still remain popular at our house. However, sometimes a couple of farmers just need a slice of hearty bread with a good amount of butter spread on top. Enter the morning glory breakfast loaf! 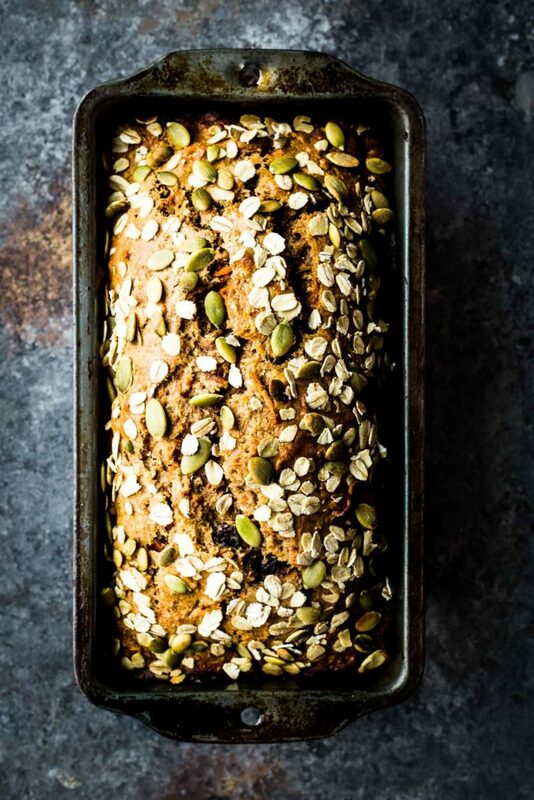 This loaf is different from my morning glory muffins because I use carrots instead of sweet potatoes and switch up the spices a bit. It’s a delicious way to start the day when paired with a cup of strong black coffee. I love making this bead in the evening and letting it cool overnight (covered in foil). In the morning I’ll slice it, toast it, and smear it with a healthy amount of butter and a drizzle of honey. It’s absolutely delicious and I hope you all enjoy this tasty loaf as much as Taylor and I do. Pour a cup of coffee and dig in! Preheat the oven to 350F. Grease a 9 inch loaf pan with oil and set aside. In a medium sized bowl whisk together the oil, honey, apple sauce, eggs, and vanilla. Add the grated carrots and set aside. In a large bowl whisk together the flour, baking powder, baking soda, salt, spices and coconut. Add the wet ingredients to the dry ingredients and stir until evenly incorporated. Gently fold in the raisins and walnuts. Pour the batter into the prepared loaf pan. Sprinkle the top with pumpkin seeds and oats. Bake in the oven for 45-55 minutes or until a toothpick comes out clean when inserted in the center of the loaf. Cool the bread for 15 minutes in the pan before slicing and serving. This looks amazing – my mouth is watering! Could oat flour be used instead of whole wheat pastry flour to make this bread gluten free? This loaf is full of so much goodness! What a wholesome and nourishing way to start the day. I think the 1/2 cup of honey is perfect and probably allows the natural sweetness of the raisins and honey to really shine through. Hello, this recipe sounds delicious! I can’t wait to try it. Can regular whole wheat flour be used in place of whole wheat pastry flour? Can an adjustment be made to compensate for the difference? Thank you. Yes! However the loaf will be much denser with all whole wheat (which isn’t a necessarily bad!) Another option is to use half whole wheat and half all purpose flour to make it a bit lighter. Let me know what you decide to do! Hmm. You got me with this recipe. I have been a little crazy with Morning Glory muffins, but I didn’t know that I can make a breakfast loaf. I must do this recipe this weekend! Another winner of a recipe. I didn’t have any raisins so used craisins instead. I made it as a house warming to a friend who just bought a house and the loaf was a hit. I just love your recipes. Thank you for posting them. What would happen if I put pumpkin puree into this, I wonder! Does anyone know if it would totally mess the whole thing up? This looks really delicious! I was wondering if there was a vegan version to this? Could I just leave the eggs aside and put a little more apple sauce and baking soda in it? Or add apple cidre? If I try a vegan version, I’ll definitely mention what I changed below. But thanks a lot for this great recipe! Let me know how it turns out. I would definitely make a flax “egg” instead of more apple sauce. Keep me posted! Delicious! Made it with my 2.5 yr old today and everyone loves it. Easy to make. I’m so happy to hear this! love it! Hi I really want to bake this but do not have the flour…Would I be able to try it with AP ? I think AP will work out just fine here! Let me know how the loaf is! Happy baking. Great start to the day! I didn’t have a loaf pan so just used a muffin tin for ~35 min (per your delicious Sweet Potato Morning Glory Muffins recipe!) and it tasted delicious; just a touch dry though. Any tips for converting this one from a loaf into muffins? So…. I followed this to the letter…was cooked all the way. I ended up baking at 425 for another 15 minutes. It was perfect and so delicious. This is so scrumptious! Made it today and almost all devoured by husband kids and I! It is a bit crumbly – what could I do to prevent that next time?